Nissa has come a long way since leaving her home continent of Bala Ged in her youth. Though she made many mistakes in the past, ever since she bonded with Zendikar's soul, Nissa has learned to suppress her more reckless instincts. She did not need to access the wild essence inside herself when she had the strong and dependable force of an entire world on her side. But when her connection with Zendikar was ripped away, Nissa was left without the power of the land, and without her friend Ashaya, the elemental manifestation of the world's soul. Unable to make sense of her loss, and fearing for the future of the world, Nissa scoured the continent of Tazeem in search of any sign of Zendikar, until finally she understood—she had been looking in the wrong place the whole time. 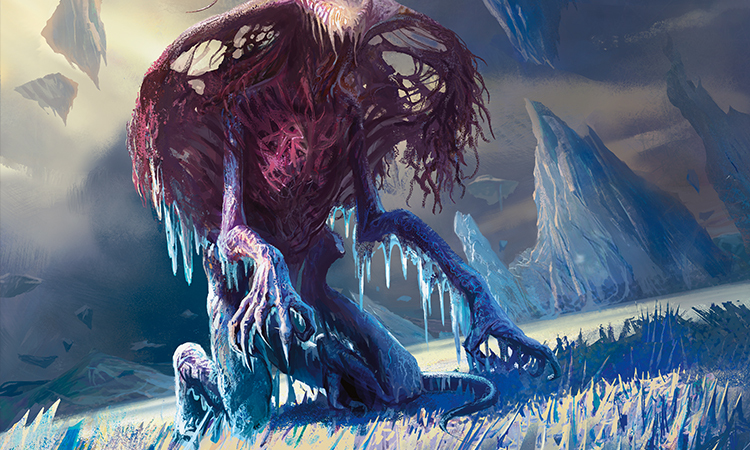 A soul threatened by the Eldrazi would have retreated, and there was only one place powerful enough to offer protection to something so precious: the mighty flower Khalni Heart. Without hesitation, Nissa planeswalked to the place where the new bloom was said to grow, Bala Ged. It was time to go home. Not in the way Gideon meant it, not like the battle cry, but for the deepest part of the land, for the soul of the world. That was why Nissa was doing this. She reminded herself one more time, and she told herself again to open her eyes. In her rush to planeswalk here to Bala Ged, Nissa hadn't thought about what she would find when she arrived—aside from Khalni Heart, where she was convinced the soul of Zendikar would be waiting for her. But the sight that greeted her, endlessly white, endlessly corrupted, had driven her to snap her eyes shut on her home continent. Of course, she had known it would be this way. 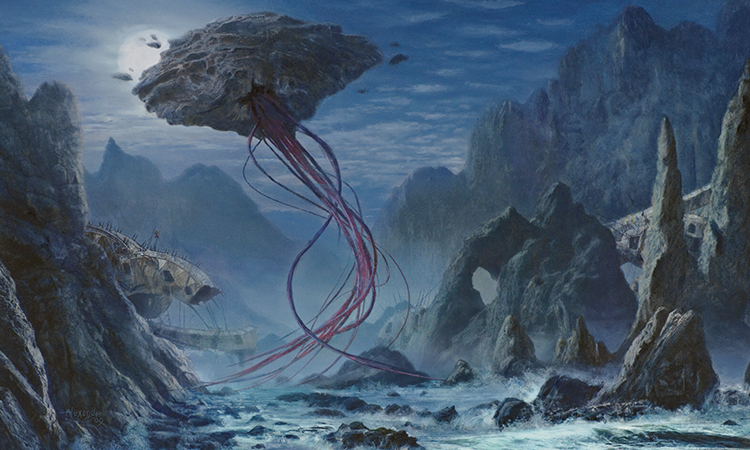 Bala Ged had fallen to the Eldrazi; the whole world knew that. But in all the time since she had heard, she hadn't thought of it like this. She had pictured a ruined land, great swaths of chalky white corruption, dead trees. But those visualizations were based on what she had seen on Tazeem—a falling continent, not a fallen one. On Bala Ged, there was nothing. How could everything, everything, just be—white, empty, gone? Yet somehow it was real. The land wasn't ruined—it had been entirely consumed. There were no dead trees. There were not even vestiges of dead trees; the white landscape was completely flat, the trees had all disintegrated. Everything had disintegrated. And there weren't swaths of corruption; swaths of one thing by definition meant that there also had to be swaths, or at least rivulets, of another thing. And here there wasn't anything but corruption. Aside from Khalni Heart, Nissa reminded herself; there wasn't anything here but Khalni Heart. 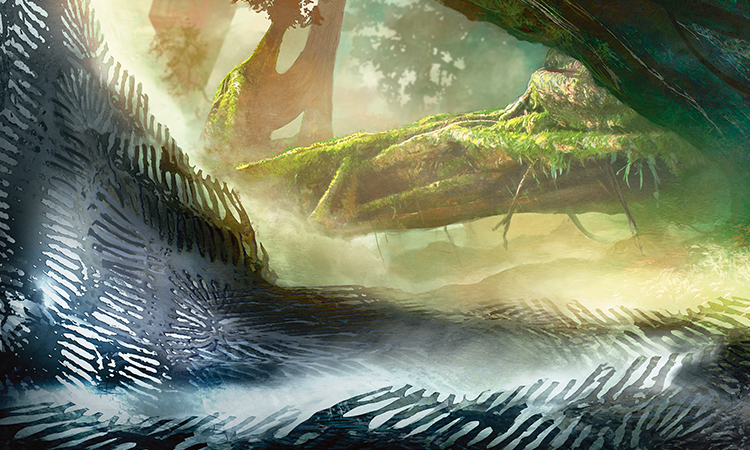 If the rumors were true—and they were, they must be—then the heart of Zendikar's power had come here to revive the land, growing a new bud somewhere on this continent. Wherever that was, that's where she would find the soul of the land. That's where Zendikar must have retreated. She told herself to take one step forward, and then another, and another. The chalky corruption cracked and crunched underfoot as she walked, her footprints becoming the first variance the dusty continent had seen since its fall. Welcome home, she thought to herself as she set off across Bala Ged. It didn't seem reasonable that she would be able to recognize any particular part of this uniform wasteland—a whole day of walking and she might as well have been marching in place, for all the landscape changed. But Nissa knew exactly where she was standing as she slowed to a stop deep within the continent. Her feet had trodden here countless times. In fact, there was a time in her life when she thought this would be the only land her feet would ever know. She had imagined that she would be walking on the same paths, gathering around the same fires, picking fruit from the same trees until she was one of the Joraga elders. This had been her village. This right here had been the towering jurworrel tree. And over there the storage tent where the Joraga dried all their meats, and fruits, and tender forest mushrooms. And here, the largest of the firepits, the one where they burned the nettled bloodbriar vines in the fall while Chief Numa led the chants. Nissa could see it all, she could hear it, she could even smell her mother's stew. The scent of it triggered her memories. It should have been a welcome thing to remember, she wished it was, but of all the times her mother had made stew, her mind took her back to that one night, the last night, the only night she didn't want to think of ever again. She had woken up from a vision to the smell of the stew . . . and to voices. It was the voices that had convinced her to leave. And she had stolen away in the night. Nissa could see herself slipping off into the shadows. She turned away from the sight, from the elf she had been. She hadn't thought of that elf in a long while. In fact, she had done all she could to forget that elf. That elf had made so many mistakes—horrible mistakes—after leaving this village. Mistakes that still haunted Nissa, mistakes that would haunt her forever. But she wasn't that elf anymore. And the only reason she wasn't was because of Zendikar's soul. It was her connection with the land that had changed her, saved her. It was Zendikar that kept her focused, balanced, and sure. It was Zendikar that guided her. She needed Zendikar. In that moment, Nissa realized that she had come here to Bala Ged to save the world's soul not just for the land, for the plane, for the people, and not just for its power: She had come here to save the world's soul so she could save herself. Without it she would once again become the elf she had been the last time she was here—wild, reckless, and sure to misstep. She wouldn't be that elf again, she couldn't be. No. Nissa vowed that she would not leave Bala Ged without Zendikar. All the distance Nissa put between herself and her village didn't seem to matter. Though she tried to push the memories out of her mind, she couldn't stop the flashes and recollections. She felt as though she was being stalked by that unseasoned, tender-footed elf. Worse, she felt as though she was melding with the memories of it. Everything was suddenly familiar. Even though the land was a solid mass of monotonous white corruption, she knew exactly what path she was cutting through the Tangled Vales; she had hunted here countless times. She knew where to step to avoid the traps the packs of humans set for the gnarlids—and she skirted them even though they weren't there, even though she tried to stop her feet from responding to the unwelcome reminiscence. Her knees instinctively braced themselves to climb a hill that didn't exist. And when she had taken enough steps to have reached the hilltop, her mouth watered and her stomach growled, anticipating she would make a snack of the thick-growing mushrooms at the summit as she always did. Then, when she heard the shrill chatter of a gomazoa, she ducked to avoid it—the ghost of a memory of a deadly hunter. She pushed it from her mind, but the call followed her, mocking her inability to separate reality from unwanted memory. Her hand moved to her sword on instinct. Foolish elf. There was nothing there—Nissa came up short. The thing she had seen out of the corner of her eye wasn't a memory. And it wasn't a gomazoa either. But it was close enough: The midsize Eldrazi had tentacles and a soft, fleshy body, just like the predator from her past. Nissa was lunging at it, blade out, before her conscious mind told her to move. She had done this before. Right here on this ground. More times than she could count. One slice up through its center, and a second across its front side. She quartered the monstrosity so quickly that the echo of its sharp cry persisted for a beat after its life had ended. Something inside Nissa stirred. She stood, breathing heavily, above the body of the Eldrazi. She hadn't fought like that in what felt like a lifetime. She had forgotten the rush of wielding her blade with such precision and force. There was more force inside her. More power that she could—no. Nissa swallowed hard, forcing down the thread that threatened to unravel her. She was not that elf. This was not that Bala Ged. And the thing in front of her wasn't a gomazoa. It was an Eldrazi. Nissa had never been so thrilled to see one of these monstrosities in her life, nor would she ever be again, but now, here on this wasted continent, there was only one thing that the presence of this Eldrazi could mean: life. There must be something here for it to feed on. There had to be, or it wouldn't be here. Nissa didn't know much about the otherworldly monstrosities that had descended upon Zendikar; for the most part, they proved inscrutable. But she did know one thing: They were ceaselessly hungry, on a never-ending path of devouring destruction. They only traveled where there was something to consume, and to them that meant life. Somewhere on Bala Ged, there was life. It had to be Khalni Heart. Her heart pounding against her ribs and her eyes set on the dimpled trail the scrabbling Eldrazi had left in its wake, Nissa raced across the land. Wherever the monstrosity had come from, whatever it had left behind to pursue and feed on her, that's where she hoped she would find the life she was looking for. This kind of tracking was effortless for Nissa—the ranger elf she used to be had trailed hundreds of creatures across this very ground. Though the Eldrazi's prints might not stand out against the pockmarked corruption to the untrained eye, Nissa saw the trail like a glowing beacon. She followed it down the path that the Umung River used to take through the Vales—now just more chalky corruption. She ran through the Guum Wilds—she never would have dared to run with such haphazard abandon through what had once been the thickest and most poisonous part of the jungle. And she made a beeline toward the caves where the surrakar used to nest. When she realized that's where she was headed, Nissa slowed just slightly. A shiver ran down her spine at the thought of the territorial, reptilian beasts. Her mind was on their deep tunnel system that ran under Bala Ged. Had that been corrupted, too? 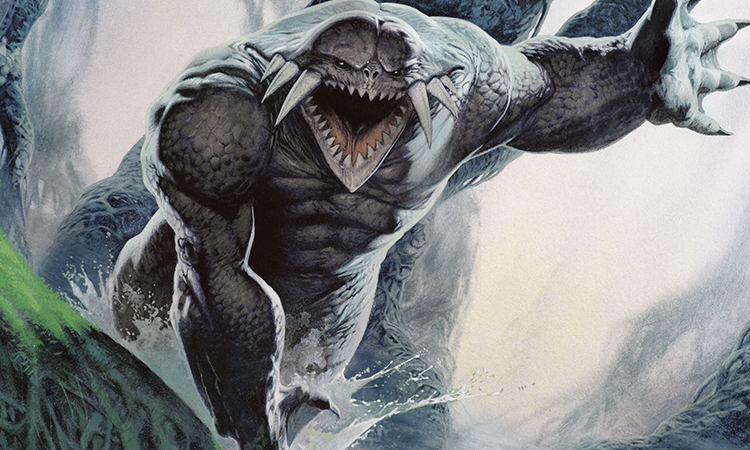 Had the Eldrazi gone beneath the surface? Or had they neglected the tunnels, leaving those things that were hidden below to survive? Nissa wasn't sure what she hoped for. What would she rather face, a pack of hungry surrakars or more desecrated land? 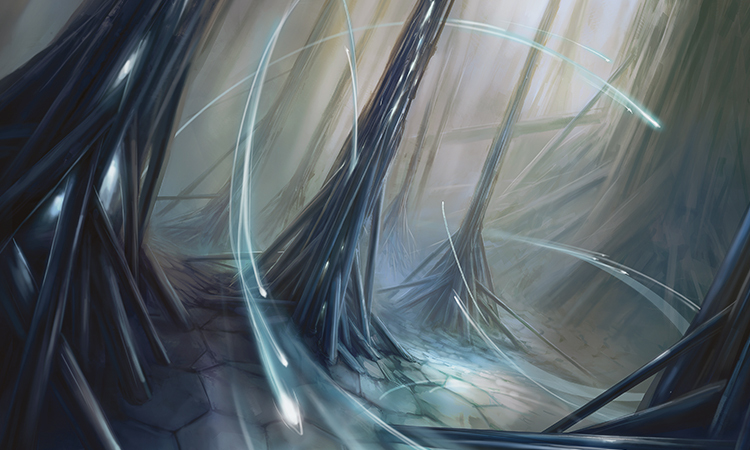 She didn't have the answer, at least not one she was willing to admit, and she didn't have long to consider it—it was at the partially collapsed and corrupted mouth of a surrakar tunnel, where the Eldrazi tracks circled around, that she saw the first sign of life. A delicate blanket of pale green moss, one that looked like it was barely holding on, lined the crumbling opening. Nissa dropped to her knees and ran her fingers across the stubble of green. It was soft, fragile, and a little bit warm. Her spirit brimmed, and impulsively she reached down into the land, searching for any sign of the world's soul—but retracted just as quickly, withdrawing from the vast, echoing emptiness. This had to be the place, but then where was Zendikar? Shouldn't she be able to feel Khalni Heart by now? She pushed the doubt and worry from her mind; it would be here. The fine film of green extended down into the tunnel below. Nissa wasn't sure if it was a combination of the darkness and her hope, or if it was real, but it appeared that the moss got thicker and more robust deeper into the tunnel. Either way, it was there, like a trail that would lead her home. Her limbs couldn't move fast enough for her longing. She crawled into the tunnel, clambering along as rapidly as possible in the tight quarters. Her eyes had not deceived her above: The farther into the tunnel she went, the thicker the moss became under her fingers and palms—thicker, but more brittle? Another trace of doubt tickled the back of her mind. Something wasn't right here. She felt unsettled. As she pushed forward, her senses heightened, alert for what she did not know. The narrow tunnel opened to reveal a cavern washed in a bluish glow. That was odd. She narrowed her eyes, straining to see farther ahead, and her ears pricked up, tilting first one way and then another. But she could ascertain no further clues as to what the blue light was, so she crawled into the high-ceilinged cavity and pushed herself to her feet. Her breath caught and her mind reeled, trying to assemble the pieces of what she was seeing. The blue light was coming from a tight circle of hedrons linked together with a network of crisscrossing, glowing leylines of power. The leylines were arranged in a pattern she had never seen before—it was unnatural. Why was this here? What—who—had done this? Not a surrakar. She was fairly sure they had no interest whatsoever in arranging hedrons. Her skin crawled; she could no longer dismiss her worry. She stalked slowly around the circle, eyes tracking, hairs on her arms standing on end. Nothing was right here, nothing had been right since she'd entered the cave. The force that had stirred within her when she slew the Eldrazi above bubbled up once more. It was ready for whatever lay ahead—which meant it was up to Nissa to hold it back. This was not the time; too much was at stake. She quieted it and turned her attention to the hedrons. Each hedron was propped up at its base with a mound of dirt that looked to have been raked together, intentionally, with someone's (or something's) fingers—or claws. At first, it seemed like the ring of hedrons was complete, but then Nissa came upon a gap, one that looked to be exactly the size of a single hedron. And it was through that gap that Nissa saw it: Khalni Heart. Her heart leapt—and with the next beat plummeted. The young flower was lying on a slab of stone, its half-wilted petals draped over one side and its roots, thick with chunks of dried, clinging dirt, dangling over the other. At the sight of the exposed roots, an agonizing memory flashed through Nissa's mind. The pain, the ripping sensation. Suddenly she was back on the ridge at the edge of the Vastwood Forest of Tazeem. It was as though her bond with Zendikar was being broken all over again. Zendikar's soul had not retreated to Khalni Heart freely; someone had done this to it. Even as the Eldrazi plagued the land, someone had uprooted the land's soul and trapped it here to die. Who could be so cruel? Stronger than the shock that threatened to paralyze her, Nissa's instincts drove her actions. Her legs moved, carrying her forward toward the flower. Her arms reached out in a bid for protection. But before she could breach the hedron prison, a gust of wind blew across her skin, and something hard and hot slammed into her side. She flew across the cave and skidded along the ground. Gasping to reclaim the breath that had been knocked out of her, Nissa pushed herself up to her hands and knees only to be swatted down again. She tumbled and rolled across the cave floor, landing on her back—looking straight up at a demon. "Why are you here?" The demon's deep voice was somehow both resonant and empty. He loomed over her; his wings, only half spread, filled the width of the cave, blocking her view of the hedron prison and the flower. Long, sharp barbs lined his arms and legs, and five thick horns framed his head. "Who sent you?" This demon was the one who had done it. Looking into his glowing red eyes, Nissa knew it without a doubt. 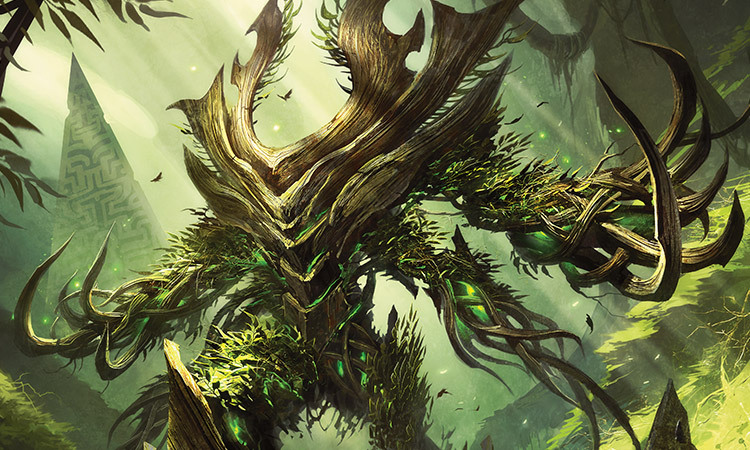 He was the one who had uprooted Zendikar. He had stolen her friend from her, had caused her immeasurable pain, had harmed the world's soul. And for that, Nissa hated him. "Answer me!" the demon raged. Veins of hot, lava-like magic shot across his chest and down his arms. "How did you find me?" He darted at her. In one fluid motion, Nissa drew her sword, but the demon was fast, too. He clamped his hand around her wrist, bending it back and wrenching her fingers from her weapon. As her blade clattered onto the rock, the demon threw the weight of his body at her, forcing her back and down as though he meant to bury her right there in the ground. "Was it Nahiri?" Nissa struggled against his weight. He was nearly three times her size, so he would have the advantage—or at least he would believe he had the advantage. Elves were among the lightest of the races on Zendikar, but a well-practiced elf could take down any of the heavier races—or creatures—of the world. 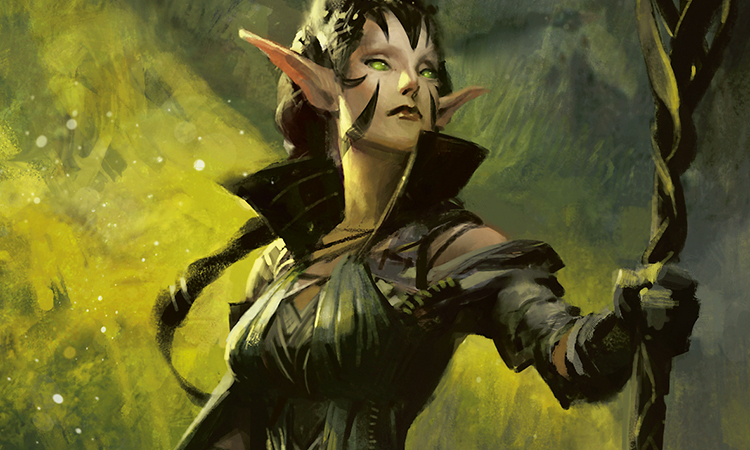 And Nissa was a well-practiced elf, or at least she had been. The elf she was before, the one who had lived here on Bala Ged, had once grappled with a spiked baloth and come out victorious. This demon was no different from the baloth. He was one creature, one animal, and she could take him down. Nissa gauged his movements as they wrestled, and it didn't take her long to identify his center of gravity. Once she found it, she played against it, gaining more of an advantage with each move she made. When she had enough leverage, she tucked her feet up and kicked his chest in just the right place to knock him off balance, launching him away from her. The demon staggered back, catching himself in midair with a powerful flap of his leathery wings. He made to come at her again, but Nissa was quicker this time; the movements and instincts of combat were coming back to her. Having retrieved her sword, she thrust the blade at him, catching the side of his leg even as he dodged, drawing blood. His eyes contracted and he bellowed. But Nissa didn't flinch. He hovered above her with a look on his face that she couldn't quite read. There was hatred there, that much was clear, but there was also something else, something disconcerted. He hissed. "If Nahiri thinks she can stop me now, she is sorely mistaken." Nissa didn't know what he was talking about and she didn't care. She lunged with her sword again, but she was unprepared for his counterstroke. The demon spun on her, the burning force inside him welling up until it burst out of his palm, blasting straight at her chest. It was a life-draining power that tapped straight into Nissa's essence—and fed the demon's darkness as it did. Though she had grown adept at ignoring the power inside her, even suppressing it, it had not declined. And now, as it was threatened, as it was pulled away from her, a deep-seated, racking wave of pain crashed over her. Nissa gasped and lurched, staggering under the sickening feeling of weakness. If she did not act, this would be the end. The demon would drain her, and next Zendikar. She knew what she had to do. He left her with no choice. She would just use a fraction of it, just for a moment. It wasn't easy to wield at first. Though the power was anxious to be unleashed, Nissa felt out of place using it, like she was navigating the dark room of a stranger's house. She stumbled and floundered as she channeled it up through her chest and out into her arm. Lifting her sword felt like lifting an entire jaddi tree, but she held the blade up and forced her essence down through it. The more the power flowed, the more she recognized it. Something inside her was waking up, and it was thrilled that morning had finally come. She angled the charged blade between her chest and the demon's blast of draining energy and pushed on it with all the strength within her. Suddenly, the full force of Nissa's essence came rushing back to her—and with it all of the memories, all of the horrors, the missteps, the mistakes. How many times had she wielded this power only to ruin everything? How often had she caused more harm than good? She couldn't trust herself. But it was too late for that. The demon's attack was reflected off the power infused in her blade, and it shot straight back at him. The force of the blow sent both Nissa and the demon rocketing backward, crashing into opposite walls of the cave. Nissa's head spun and her fingers tingled with power, impatient power. She jumped to her feet as the demon stalked toward her. "Impressive," he said. "Your looks deceive. You're dressed like a simple Joraga." He sniffed the air around her. "But you smell like the Blind Eternities. 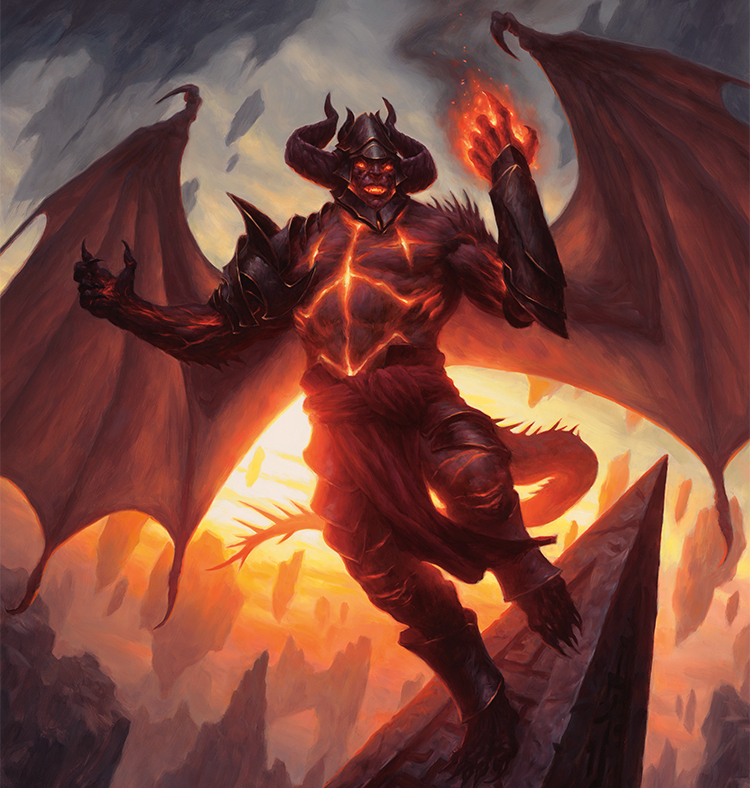 Planeswalker." Nissa tensed. Was he a Planeswalker, too? He must be. She focused her senses on him, feeling for his energy. There was something there at the edges of his being, but it wasn't quite right, and she couldn't identify why. "I shouldn't have expected any less from Nahiri's emissary," he said. "But I have to ask, why did she send you? Why didn't she come herself?" "I don't know what you're talking about." 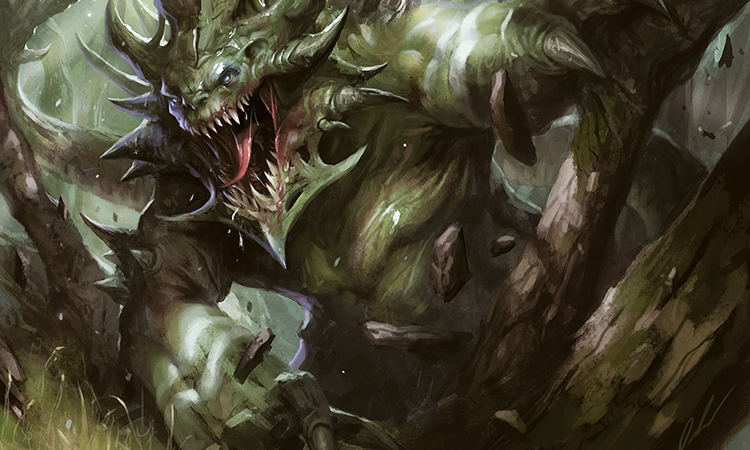 Nissa held back the urge to rush at the demon—but just barely. The well of power inside her was exhilarated, and it would not be restrained for long. "Perhaps it was because Nahiri was afraid to face me, worried that once this is done, I will wield more power than any single Planeswalker has controlled in a very long time." The demon glanced back at the flower, and Nissa followed his gaze, her heart beating for Zendikar. "The power of an entire world will all be mine." "That power isn't for you." Nissa's words came out strong and sure, buoyed by the surging force in her veins. "Khalni Heart belongs to the land." "Don't be naive," the demon snapped. "Power belongs to those who take it. I took it. So it's mine." "Then I'll take it back." Nissa could no longer stop herself; her wild essence spurred her on, and she dove toward the opening between the hedrons. She had come for Zendikar, and she would not leave without it—but the demon shot another blast, and Nissa was forced to dodge. "You don't want to die here, elf," he said. "It's not worth it. Not for whatever Nahiri has promised you." "I don't know who Nahiri is," Nissa shot back. But the demon was right, she didn't want to die here. What was she doing? She was showing blatant disregard for her life, for the life of Khalni Heart, which was right there in front of her, vulnerable and fading. It was the volatile energy inside that was directing her actions. That shouldn't have happened. She was only supposed to have accessed it for a moment; she had promised herself that. She wasn't that elf anymore. She was the elf who was in control, the elf who silenced the erratic and unstable impulses that rose up from within. The elf who depended on her bond with the land to draw the power that she needed, power that she could trust, power that didn't make mistakes. That sure-footed elf was the elf who had come here to save Zendikar, and that was the only elf who would succeed. With effort, she drove her prodding, eager essence downward, biting back its will for her to dive straight at the demon again. It wouldn't work. There were other ways past him than by sheer force. She had to think. She had to focus. The problem was, there was only one way into the ring of hedrons, so the demon would always know which way she was going to go. But if there were another hole in the circle . . . yes! That was the kind of elf she was. "If Nahiri didn't send you, then why are you here?" The demon leered at her. Nissa nodded past him to Khalni Heart, an excuse to survey the ring of hedrons. "I'm here to save that flower. I'm here for Zendikar." "For Zendikar?" The demon barked a laugh. "Either you are lying or you're delusional. Have you seen Zendikar lately? There's nothing left to save. Soon the Eldrazi will consume everything." "They won't." Nissa set her sights on a hedron to the demon's left. "You say that with such confidence." "Yes." Nissa tensed, ready to run. "And who's going to stop the Eldrazi?" the demon asked. "You?" "Yes," Nissa said. "Me." She charged. The demon moved to block the entrance to the prison, but that was not where she was headed. She launched herself into the air, somersaulting toward the hedron to his left, a clear path in front of her. She readied her blade for the strike. But as the hedron came into range, she knew she would not succeed. Echoes of a distant memory played in her mind. She had broken a hedron once before. A hedron in a cave, much like this one. However, it had required the power of her essence. If she struck the rock now with only her bare blade, she would be lucky to leave a mark. She needed more power, more of her. 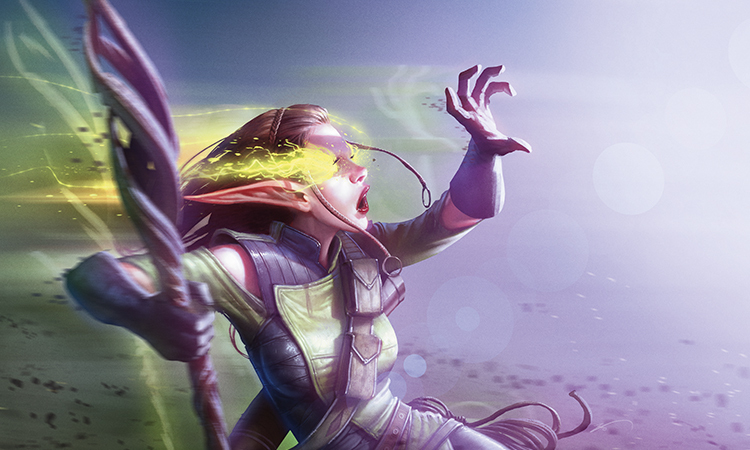 It was unclear if it was by choice—it was unclear if she had a choice at all—but as her blade crashed into the hedron, the essence within Nissa burst out. And then the demon crashed into her. They rolled across the ground, struggling against each other, evenly matched. Nissa kept her eyes on the hedron, waiting for it to crack, waiting for the cascade of chaos she knew would follow. Waiting to see if she had acted in time. A heartbeat later, a fissure of power erupted on the hedron's surface, spidering out down its sides, and the next instant, the massive rock shattered. As it did, the pattern of leylines that had been connected to it began to tremble and quiver, breaking down. The reverberations sent the other hedrons rocking. The prison was losing its integrity. Soon it would collapse entirely, and most likely bring the rest of the cave down with it. Now was Nissa's only chance. She saw what she had to do, and she tapped into her power again. This time she used it to fling the demon off of her. She sprang to her feet and darted for Khalni Heart. "No!" the demon roared. "I won't let you do this!" He lunged after her, but he hesitated between Nissa and the precariously teetering hedrons. She saw the doubt in his eyes and then the flash of decision as he launched himself at the nearest angular stone, wrapping his thick arms around it, straining to hold it up. Nissa leapt past him and reached for Khalni Heart. The moment her fingers touched the flower—it was everything. The word, the presence, the soul echoed within her. And then the demon's hand closed around hers, squeezing so hard she thought she would strangle the flower. "That was foolish." The fire within him raged. "More than foolish." But he was no longer supporting the quaking hedrons. The leylines splayed as the stones crashed around them, falling in a cascade. 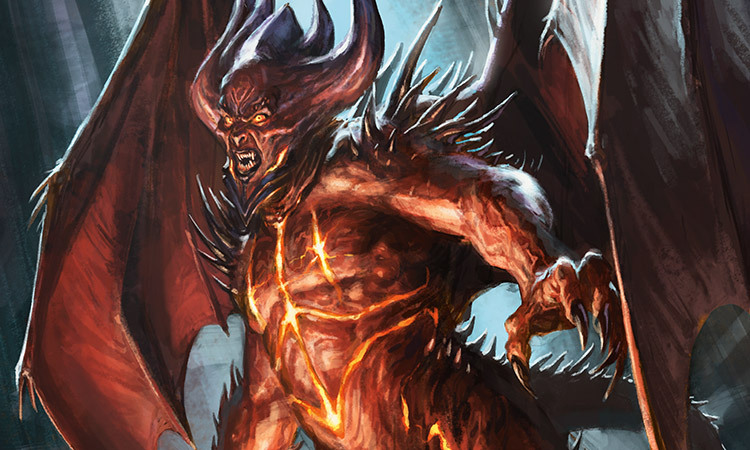 The demon looked to Nissa, hot hatred radiating outward from his glare. "And now you'll pay for it." His fury poured from him into Nissa, locking her in place like a harness. She struggled to free herself, but with every breath, he drained more of her strength to fight back. His singular focus was to kill her right there, destroy her. She could feel it. She could see it in his eyes. "No matter how much you might want this," the demon lifted their joined hands and Khalni Heart, "I want it more. And I will have it." His rage burned stronger with every weakening beat of Nissa's heart. "If you want to live, now is the time to planeswalk away." Nissa panicked. The edges of her vision were going dark. Her eyes darted to Khalni Heart. Her ebbing essence reached for the power of Zendikar, the power that was right there in her hands. With it she could crush the demon, she could win—all she had to do was take it. No. Nissa stopped herself, reining in her desperation. 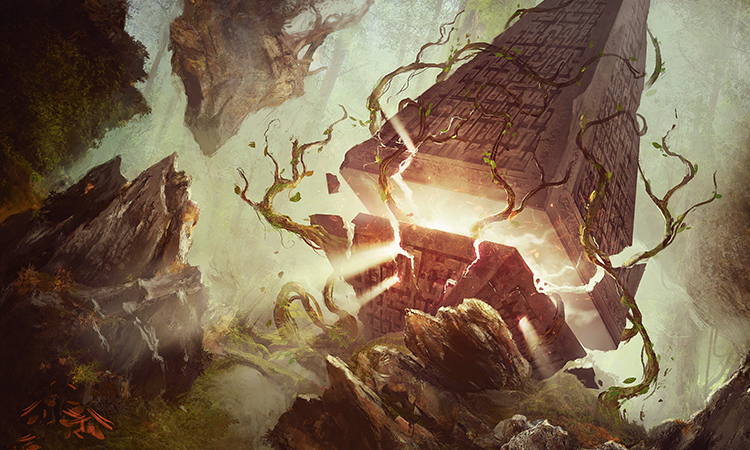 Zendikar didn't have power to give her, not now, when it was uprooted and unconnected to the land. 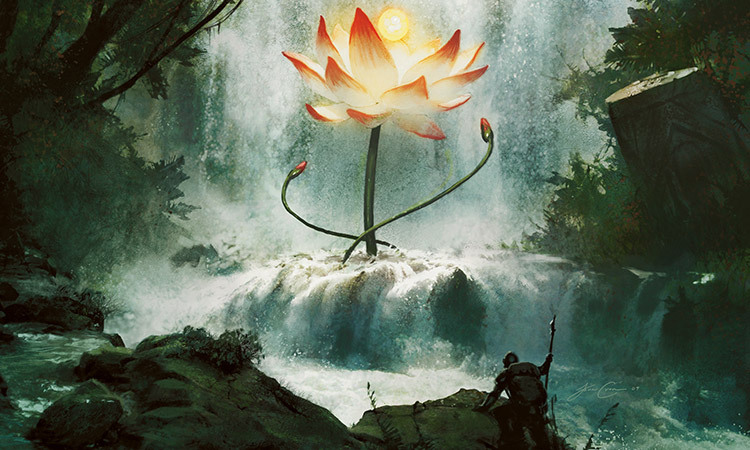 If she pulled on it, she would drain it, she would destroy the flower, and she would bring an end to Zendikar. She wasn't that elf anymore, the one who acted without knowing the consequences. She wasn't going to make that kind of mistake. Then what? Fall to the demon? No. She wasn't that elf either. She was something in between who she had been long ago and who she thought she had become. Neither was completely true. It had been a mistake to dam down the force inside her for so long—she was powerful, more powerful even than this demon, and that wasn't something she should hide. But she had not been wrong to learn control, to learn caution. It was never the power that had been wrong, never the passion. She had always done things for the right reasons, always with the right intentions. But she had made mistakes because she didn't have the awareness of the world around her, the deeper understanding required to act with care. She had learned from Zendikar. She could see the patterns and connections, she could feel the bigger picture. This cave, these hedrons, the power of Khalni Heart, the draining essence of the demon. She could also see the whole of Zendikar, the Eldrazi, the other Planeswalkers, the camp of survivors. And she could see the Multiverse, all of the myriad worlds. She had a place in it all. She had a power that belonged. One that she was meant to use—today, right now, to save Zendikar. What she was about to do was dangerous. Possibly the most dangerous thing she had ever done. But it was not a risk. She knew exactly what would happen. And she was prepared. Nissa collected all the power left within her, everything the demon had yet to drain, and she pulled it away from him. She could feel his grip on the other side of it, feel him straining against her, but she forced it down through her arms, through her fingertips, and into Khalni Heart. As her essence rushed into the flower, it came alive. Its petals lifted, its leaves unfurled, it brightened. And finally its roots began to grow. They reached downward toward the ground. "What are you doing?" The demon yanked back on her essence. She could see the confusion in his eyes. Nissa felt like a willow's branch, tugged down by the demon and pulled up through the strength of her center. The roots of Khalni Heart had almost reached the ground. She sent one final wave out into Zendikar's soul, and then her vision darkened and her body slackened. The demon ripped the flower out of her limp fingers, and Nissa fell to her knees. "This world is mine!" he snarled. "This power belongs to me." The roots had reached the ground. The world's soul had returned to the land. Zendikar belonged to no one. 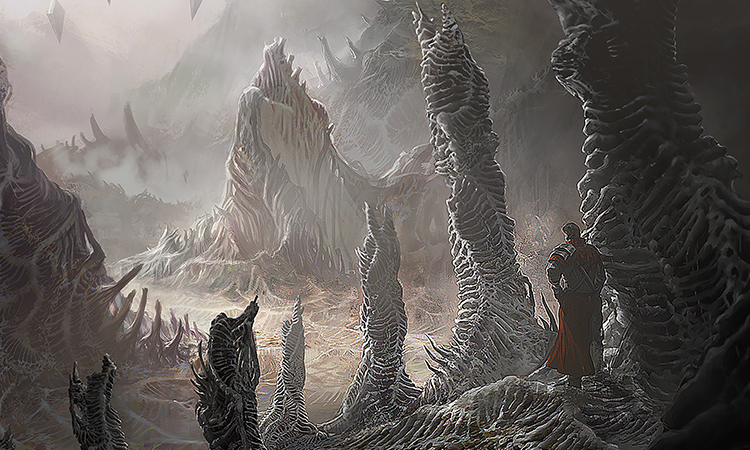 The land surged upward, sending chunks of rock flying as it reached for Khalni Heart. It pulled the flower down, out of the demon's hands, and into the world's embrace. "No!" The demon dropped to his knees, scrabbling at the ground with grotesque nails. But it was too late. The land had already sealed over the heart of power. The flower was gone. It was safe. The whole cave began to shudder as the strength of Zendikar surged up through Nissa's palms, filling the emptiness inside her, blending with the single drop of her own essence that remained. The demon was sent lurching. He reached for the wall to steady himself, but the wall burst open. He shot up into the air, dodging the rock. "What have you done?" Nissa got to her feet and turned to face him. "If you want to live, now is the time to planeswalk away." She reached for her bond with Zendikar, drawing on both the power inside her and the power of the world, calling up an extension of her being, a perfection of her form. As she swung at the demon, the dirt and detritus moved with her, driving a fist of land straight into his chest. He was sent careening back into the collapsing rock wall. Nissa leapt from one shattering piece of land to the next, each fragment of Zendikar alternatingly cradling her landing and lending her its power to spring off. As the world crashed down on the demon, Nissa rose up, and so too did the world's soul, her friend. When she reached the surface, Nissa's feet touched down on a soft, lush carpet of moss. She breathed in the smell of vibrant life. Next to her, the towering elemental, made of the remnants of the tunnel and the collapsing land, did the same. Nissa looked up at her friend. Ashaya sent a surge of fervor down to Nissa, and Nissa sent her own essence back. They were one, and also they were each their own, stronger for the power they shared. Now it was time to use that power to save Zendikar. Nissa and Ashaya would return to Sea Gate, they would meet Gideon's army, and they would join in his battle cry, for the words had meaning once more. Together, they set off across the continent, matching each other stride for stride.